Just in time for the fifth season premiere of the highest-rated series on The CW, you will be zooming into stores to pick up The Flash: The Complete Fourth Season as Warner Bros. Home Entertainment releases the Blu-ray and DVD on August 28, 2018. BURBANK, CA (May 16, 2018) – Just in time for the fifth season premiere of the highest-rated series on The CW, you will be zooming into stores to pick up The Flash: The Complete Fourth Season as Warner Bros. Home Entertainment releases the Blu-ray and DVD on August 28, 2018. 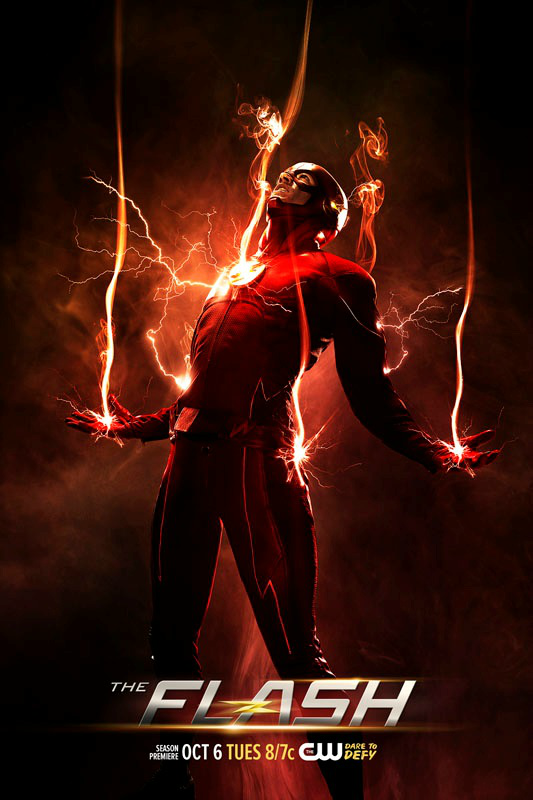 With nearly 4.2 million weekly viewers, The Flash is currently The CW’s highest-rated series. * Fans will be able to catch up on the fourth season as they speed-watch all 23 electrifying episodes, including the epic DC Crossover, new featurettes, the series’ 2017 Comic-Con Panel and more. The Flash: The Complete Fourth Season is priced to own at $49.99 SRP for the DVD and $54.97 SRP for the Blu-ray which includes a Digital Copy. The Flash: The Complete Fourth Season is also available to own on Digital via purchase from digital retailers. “After four seasons on the air, The Flash continues to be the one of the most popular shows on The CW,” said Rosemary Markson, WBHE Senior Vice President, Television Marketing. "We’re thrilled to offer loyal fans 25 hours of entertainment with the complete fourth season and captivating extra content." 23 ONE-HOUR EPISODES: "The Flash Reborn"; "Mixed Signals"; "Luck Be A Lady"; "Elongated Journey Into Night”; "Girls Night Out"; "When Harry Met Harry…"; "Therefore I Am"; "Crisis on Earth-X: Part 3"; "Don't Run"; "The Trial of the Flash"; “The Elongated Knight Rises”; "Honey, I Shrunk Team Flash"; "True Colors"; "Subject 9"; "Enter Flashtime"; "Run, Iris, Run"; "Null and Annoyed"; "Lose Yourself"; "Fury Rogue"; "Therefore She Is"; "Harry and the Harrisons"; "Think Fast"; and "We Are The Flash." DIGITAL The fourth season of The Flash is also currently available to own on Digital. Digital allows consumers to instantly stream and download all episodes to watch anywhere and anytime on their favorite devices. Digital is available from various retailers including Amazon Video, iTunes, PlayStation, Vudu, Xbox and others. A Digital Copy is also included with the purchase of specially marked Blu-ray discs for redemption and cloud storage. About Warner Bros. Home Entertainment, Inc. Warner Bros. Home Entertainment (WBHE) brings together Warner Bros. Entertainment's home video, digital distribution and interactive entertainment businesses in order to maximize current and next-generation distribution scenarios. An industry leader since its inception, WBHE oversees the global distribution of content through packaged goods (Blu-ray Disc™ and DVD) and digital media in the form of electronic sell-through and video-on-demand via cable, satellite, online and mobile channels, and is a significant developer and publisher for console and online video game titles worldwide. WBHE distributes its product through third party retail partners and licensees. About DC Entertainment DC Entertainment, home to iconic brands DC (Superman, Batman, Green Lantern, Wonder Woman, The Flash, etc. ), Vertigo (Sandman, Fables, etc.) and MAD, is the creative division charged with strategically integrating across Warner Bros. and Time Warner. DC Entertainment works in concert with many key Warner Bros. divisions to unleash its stories and characters across all media, including but not limited to film, television, consumer products, home entertainment, and interactive games. Publishing thousands of comic books, graphic novels and magazines each year, DC Entertainment is one of the largest English-language publishers of comics in the world. We have quite a few exclusive photos of DC's Legends of Tomorrow cast, including former "Flsh" cast member Victor Garber, at San Diego Comic-Con 2017 in July! “The Flash” is nominated for a Teen Choice Award for Action TV Show (#ChoiceActionTVShow). Grant Gustin (Barry) and Wentworth Miller (Leonard Snart) are both nominated for a Teen Choice Award for Action TV Actor (#ChoiceActionTVActor). Candice Patton (Iris) and Danielle Panabaker (Caitlin) are both nominated for a Teen Choice Award for TV Actress (#ChoiceActionTVActress). Vote Now! The show Airs Sunday, August 13, LIVE on FOX. Grant Gustin & John Wesley Shipp Defend The Flash Ezra Miller! As a teen, he held an integrated party – and was run out of town. Now, he’s back as a superhero. Candice Patton Jokes She Would Rename The Flash "Damn it, Barry"
DAVID RAMSEY GUEST STARS - When DeVoe assaults an A.R.G.U.S. facility to complete his Enlightenment Machine, Barry (Grant Gustin) realizes the only way he can stop him is if he allows Cisco (Carlos Valdes) and Caitlin (Danielle Panabaker) to accompany him into the facility. Still shaken by Ralph's death, Barry isn't sure he wants to risk any more of his friends' lives and considers taking on DeVoe solo. Viet Nguyen directed the episode written by Sam Chalsen & Kristen Kim (#422). Original airdate 5/15/2018. KATEE SACKHOFF ("BATTLESTAR GALACTICA") AND EMILY BETT RICKARDS ("ARROW") GUEST STAR - Having received an ominous threat from her old boss, Amunet (guest star Katee Sackhoff), Caitlin (Danielle Panabaker) fears that her past time as Killer Frost may be back to haunt her. Felicity (guest star Emily Bett Rickards) comes to Central City to help the girls celebrate Iris's (Candice Patton) bachelorette party, while Cisco (Carlos Valdes), Joe (Jesse L. Martin) and the guys take Barry out for a night on the town. Laura Belsey directed the episode written by Lauren Certo & Kristen Kim (#405). Original airdate 11/7/2017. TOM CAVANAGH DIRECTS; DANNY TREJO GUEST STARS AS BREACHER - Cisco (Carlos Valdes) is shocked when Gypsy's (guest star Jessica Camacho) father, Breacher (guest star Danny Trejo), shows up on Earth-1. Breacher takes an immediate disliking to Cisco and decides to hunt him. Meanwhile, Barry (Grant Gustin) runs into his old nemesis, Ralph Dibny (guest star Hartley Sawyer). Tom Cavanagh directed the episode written by Sterling Gates & Thomas Pound (#404). Original airdate 10/31/2017. Team Flash gets help from a surprising ally in their battle against DeVoe (Neil Sandilands). David McWhirter directed the episode written by Todd Helbing & Eric Wallace (#423). Original airdate 5/22/2018. THE TEAM TURNS TO AMUNET BLACK FOR HELP - With DeVoe's Enlightenment device nearly complete, in order to disable it The Flash (Grant Gustin) and his team must put their faith in an unlikely ally - Amunet Black (guest star Kattee Sackhoff). Meanwhile, Harry (Tom Cavanagh) hits an all-time low when the "Council of Wells" kicks him out but then Cisco (Carlos Valdes) introduces him to the "Council of Harrisons." Kevin Mock directed the episode written by Judalina Neira & Lauren Certo (#421). Original airdate 5/8/2018. GYPSY RETURNS - Barry (Grant Gustin) and Team Flash team up with Gypsy (guest star Jessica Camacho) to try to thwart Thinker's plan. Meanwhile, Cisco (Carlos Valdes) and Gypsy have a heart to heart talk about their relationship. Rob J. Greenlea directed the episode written by Sterling Gates & Thomas Pound (#420). Original airdate 5/1/2018. WENTWORTH MILLER RETURNS AS CITIZEN COLD - When Barry (Grant Gustin) needs help transporting a dangerous meta, he calls on a new friend for help - Leo Snart AKA Citizen Cold (guest star Wentworth Miller). Meanwhile, Cisco (Carlos Valdes) becomes suspicious of Harry (Tom Cavanagh). Rachel Talalay directed the episode written by Jeff Hersh & Joshua V. Gilbert (#419). Original airdate 4/24/2018. RALPH CONSIDERS CROSSING A LINE TO DEFEAT THE THINKER - When Barry (Grant Gustin) and Team Flash find a way to enter The Thinker's lair, Ralph (guest star Hartley Sawyer) considers crossing a dangerous line to defeat DeVoe. Meanwhile, Joe (Jesse L. Martin) is concerned by Harry's (Tom Cavanagh) recent behavior. Hanelle Culpepper directed the episode written by Jonathan Butler & Gabriel Garza (#418). Original airdate 4/17/2018. DANNY TREJO RETURNS AS BREACHER; KEVIN SMITH DIRECTS - Barry (Grant Gustin) and Ralph (guest star Hartley Sawyer) take different approaches to finding the remaining bus metas before DeVoe gets to them. However, Ralph's cavalier attitude frustrates Barry and the two clash over what it means to be a hero. Meanwhile, Breacher (guest star Danny Trejo) returns to ask Cisco (Carlos Valdes) for a favor. Kevin Smith directed the episode written by Lauren Certo & Kristen Kim (#417). Original airdate 4/10/2018. IRIS SUITS UP - Team Flash confront a new bus meta, Matthew AKA Melting Pot (guest star Leonardo Nam), who has the ability to swap people's DNA. During a battle with Team Flash, Matthew accidentally takes Barry's (Grant Gustin) speed away and gives it to Iris (Candice Patton). Now, with a new threat unleashed on Central City, Barry must act as the team leader while Iris takes on the mantle of superhero speedster in order to defeat their new foe. Harry Jierjian directed the episode written by Eric Wallace (#416). Original airdate 3/13/2018. JESSE QUICK AND JAY GARRICK TEAM UP WITH THE FLASH - When a nuclear bomb detonates in downtown Central City, Barry (Grant Gustin), Jesse Quick (guest star Violett Beane) and Jay Garrick (guest star John Wesley Shipp) slow down time by entering Flashtime. As everyone in the city is frozen, the three speedsters push themselves to the breaking point to save the city and everyone in it. Gregory Smith directed the episode written by Todd Helbing & Sterling Gates (#415). Original airdate 3/6/2018. KATEE SACKHOFF RETURNS AS AMUNET - Amunet (guest star Katie Sackhoff) kidnaps Caitlin (Danielle Panabaker) and puts meta-dampener handcuffs on her to keep her from turning into Killer Frost. Amunet tells Caitlin she needs her to perform a tricky medical task and if Caitlin fails, Amunet will kill her. Meanwhile, The Thinker (guest star Neil Sandilands) traps The Flash (Grant Gustin) in a speedster-proof prison. With the clock ticking, The Team doesn't have the time or resources to track both Caitlin and Barry so Iris (Candice Patton) is forced to choose who to save. Stefan Pleszczynski directed the episode written by Sam Chalsen & Judalina Neira (#409). Original airdate 12/5/2017. THE INCREDIBLE SHRINKING MEN - A meta who can shrink anything he touches battles Team Flash. Cisco (Carlos Valdes) and Ralph (guest star Hartley Sawyer) get caught in his crossfire and are shrunk to miniature versions of themselves. Cecile (guest star Danielle Nicolet) realizes her pregnancy has caused her to have temporary powers and discovers she can hear other people's thoughts, which unnerves Joe (Jesse L. Martin). Meanwhile, Barry (Grant Gustin) meets someone with a mysterious connection to Henry Allen. Chris Peppe directed the episode written by Sam Chalsen & Judalina Neira (#412). Original airdate 1/30/2018. BARRY FIGHTS FOR HIS LIFE — As Barry’s (Grant Gustin) trial for the murder of Clifford DeVoe begins, Iris (Candice Patton) and Joe (Jesse L. Martin) must decide how far they are willing to go to keep Barry out of prison. Philip Chipera directed the episode written by Lauren Certo & Kristen Kim (#410). Original airdate 1/16/2018. THE RISE OF THE HERO — When a familiar villain returns to terrorize Central City, Ralph (guest star Hartley Sawyer) must rise up to defend the innocent while Barry (Grant Gustin) is detained by his trial. Meanwhile, Barry searches for the strength to keep his optimism alive in the face of his new circumstances. Alexandra La Roche directed the episode written by Sterling Gates & Thomas Pound (#411).Original airdate 1/23/2018. BARRY MEETS DEVOE - Barry (Grant Gustin) comes face to face with DeVoe (guest star Neil Sandilands). Devoe's past is revealed through flashbacks. Meanwhile, Iris (Candice Patton) puts the final touches on the wedding, which is a week away. David McWhirter directed the episode written by Eric Wallace & Thomas Pound (#407). Original airdate 11/21/2017. TOM CAVANAGH DIRECTS; DANNY TREJO GUEST STARS AS BREACHER — Cisco (Carlos Valdes) is shocked when Gypsy’s (guest star Jessica Camacho) father, Breacher (guest star Danny Trejo), shows up on Earth-1. Breacher takes an immediate disliking to Cisco and decides to hunt him. Meanwhile, Barry (Grant Gustin) runs into his old nemesis, Ralph Dibny (guest star Hartley Sawyer). Tom Cavanagh directed the episode written by Sterling Gates & Thomas Pound (#404). Original airdate 10/31/2017. DC COMICS’ CHARACTER HAZARD COMES TO PLAY IN CENTRAL CITY — Barry (Grant Gustin) and the team are hit by a string of bad luck and realize it is the handiwork of a new meta, Becky (guest star Sugar-Lyn Beard) nicknamed Hazard, who has the ability to give others bad luck, while cashing in the benefits for herself. Meanwhile, Harry Wells (Tom Cavanagh) returns to Earth-1 to give Wally (Keiynan Lonsdale) a message from Jesse. Armen V. Kevorkian directed the episode written by Sam Chalsen & Judalina Neira (#403). Original airdate 10/24/2017. Is Anne Dudek Returning For Season 4? Did Caitlin Snow lost her meta-human powers in 'The Flash' season 4? Will season 4 tackle 'Rebirth'? Grant Gustin Says 'The Flash' Season Four Will Be More Fun! Grant Gustin admits that The Flash season 3 was too dark: "This year, we'll be back to our roots"
TOM CAVANAGH DIRECTS; BARRY TRAVELS TO THE FUTURE TO SAVE IRIS - Barry (Grant Gustin) travels to the future to find out Savitar's still unknown identity in the hopes of saving Iris (Candice Patton). Upon his arrival in 2024, Barry encounters future versions of his Team Flash friends, who, following the death of Iris, have became very different people, profoundly impacted by their showdown with Savitar. It will be up to Barry to infuse a sense of hope back into the team, as he proves to be hero his future friends have been waiting for. Meanwhile, back in 2017, the hunt for Killer Frost (Danielle Panabaker) continues. Tom Cavanagh directed the episode written by Carina Adly MacKenzie (#319). Original airdate 4/25/2017. DARREN CRISS (“GLEE”) GUEST STARS AS THE MUSIC MEISTER IN THE FLASH AND SUPERGIRL MUSICAL CROSSOVER – Barry (Grant Gustin) and team are surprised when Mon-El (guest star Chris Wood) and Hank Henshaw (guest star David Harewood) arrive on their Earth carrying a comatose Supergirl (guest star Melissa Benoist) who was whammied by the Music Meister (guest star Darren Criss). Unable to wake her up, they turn to Team Flash to save her. However, the Music Meister surprises The Flash and puts him in a similar coma, one that Team Flash can’t cure. Kara and Barry wake up without their powers in an alternate reality where life is like a musical and the only way to escape is by following the script, complete with singing and dancing, to the end. Dermott Downs directed the episode with story by Greg Berlanti & Andrew Kreisberg and teleplay by Aaron Helbing & Todd Helbing (#317). Original airdate 3/21/2017. SAVITAR VISITS WALLY – While training with Barry (Grant Gustin), Wally (Keiynan Lonsdale) starts to have visions of Savitar, which he hides from the team. A dangerous secret threatens Barry and Iris’ (Candice Patton) happiness. Alexandra La Roche directed the episode written by Andrew Kreisberg & Andrew Wilder (#315). Original airdate 3/7/2017. THE EPIC CONCLUSION TO THE TWO-PART BATTLE WITH GRODD – When Grodd (voiced by David Sobolov) and his army of gorillas bring the battle to Earth-1, The Flash (Grant Gustin) and team must find a way to stop them before they destroy Central City. Gypsy (guest star Jessica Camacho) returns to join the fight. Meanwhile, Jesse Quick (guest star Violett Beane) decides she wants to stay with Wally (Keiynan Lonsdale) on Earth-1. Dermott Downs directed the episode with story by Todd Helbing and teleplay by Benjamin Raab & Deric A. Hughes (#314). Original airdate 2/28/2017. WENTWORTH MILLER RETURNS AS CAPTAIN COLD; MIRROR MASTER AND THE TOP BATTLE WITH THE FLASH — Barry (Grant Gustin) continues to train Jesse (guest star Violett Beane) and when a new meta human, Mirror Master (guest star Grey Damon), appears on the scene he lets her tag along. Mirror Master has teamed up with his old partner, Top (guest star Ashley Rickards), and is looking for Snart (Wentworth Miller) to even a score. Jesse is quick to join the chase but defies one of Barry’s orders which results in disastrous consequences. Stefan Pleszczynski directed the episode written by Benjamin Raab & Deric A. Hughes (#304). Original airdate 10/25/2016. WHAT WOULD YOU SACRIFICE TO HAVE EVERYTHING YOU'VE EVER WANTED? - Barry (Grant Gustin) is living his dream life - his parents are alive, he's asked Iris West (Candice Patton) on a date and he can finally be a normal guy as Central City has another speedster, Kid Flash (Keiynan Lonsdale), running around saving the city. When Barry starts forgetting parts of his old life, the Reverse Flash (guest star Matt Letscher) taunts his nemesis and tells him that there will be serious repercussions for Barry and the ones he loves if he continues to live in this alternate universe. In addition to losing his memories, his powers will also start to fade. When disaster strikes, Barry must decide if he wants to continue to live in this world as Barry Allen or return to his universe as The Flash. Jesse Warn directed the episode with story by Greg Berlanti & Andrew Kreisberg and teleplay by Brooke Roberts (#301). Original airdate 10/4/2016. THE COUNTDOWN BEGINS; WENTWORTH MILLER RETURNS AS CAPTAIN COLD – With only 24 hours left until Savitar murders Iris (Candice Patton), Barry (Grant Gustin) struggles to save the woman he loves and makes the choice to use any means necessary to do so. Realizing he has one option left to save her, The Flash turns to Captain Cold (Wentworth Miller) for help. Michael Allowitz directed the episode with story by Andrew Kreisberg and teleplay by Grainne Godfree (#322). Original airdate 5/16/2017. DRASTIC TIMES CALL FOR DRASTIC MEASURES – Barry (Grant Gustin) takes drastic measures to stop Savitar. Meanwhile, H.R. (Tom Cavanagh) continues to push Tracy Brand (guest star Anne Dudek) to design the trap for Savitar and Killer Frost (Danielle Panabaker) returns with an interesting proposal. David McWhirter directed the episode written by Judalina Neira & Lauren Certo (#321). Original airdate 5/9/2017. BARRY AND TEAM TRAVEL TO GORILLA CITY AND FACE GRODD - When Jesse Quick (guest star Violett Beane) informs the team that her father (Tom Cavanagh) has been abducted, Barry (Grant Gustin), Caitlin (Danielle Panabaker), Cisco (Carlos Valdes) and Julian (Tom Felton) voyage to Earth-2 on a rescue mission to save Harry from Gorilla City. As they trek through the forest, Barry and the team are immediately captured and brought to Grodd (voiced by David Sobolov). Grodd tells them he needs their help to stop Solovar (voiced by Keith David), the leader of Gorilla City, as Solovar wants to invade Earth-1. Meanwhile, back on Earth-1, Jesse and Kid Flash (Keiynan Lonsdale) hit the streets to stop a metahuman that can control gravity, with H.R. and Joe (Jesse L. Martin) guiding them from S.T.A.R. Labs. Dermott Downs directed the episode with story by Andrew Kreisberg and teleplay by Aaron Helbing & David Kob (#313). Original airdate 2/21/2017. DC COMICS’ CHARACTER ABRA KADABRA VISITS CENTRAL CITY – The Flash (Grant Gustin) battles Abra Kadabra (guest star David Dastmalchian), a villain from Earth-19, who makes him a tempting offer – release him and Abra Kadara will reveal Savitar’s true identity. Desperate to save Iris (Candice Patton), Barry considers taking the deal but Gypsy (guest star Jessica Camacho) breaches in to capture the villain for her own reasons and during the melee, Abra Kadabra manages to escape. Barry is furious that Gypsy interfered but Gypsy refuses to back down, forcing Cisco (Carlos Valdes) to take sides. Meanwhile, Julian (Tom Felton) is still a bit cold towards Caitlin (Danielle Panabaker) but when she is severely injured in a battle with Gypsy, he rushes to her side. Nina Lopez-Corrado directed the episode with story by Andrew Kreisberg and teleplay by Brooke Roberts & David Kob (#318). Original airdate 3/28/2017. DARREN CRISS (“GLEE”) GUEST STARS AS THE MUSIC MEISTER IN THE FLASH AND SUPERGIRL MUSICAL CROSSOVER – Barry (Grant Gustin) and team are surprised when Mon- El (guest star Chris Wood) and Hank Henshaw (guest star David Harewood) arrive on their Earth carrying a comatose Supergirl (guest star Melissa Benoist) who was whammied by the Music Meister (guest star Darren Criss). Unable to wake her up, they turn to Team Flash to save her. However, the Music Meister surprises The Flash and puts him in a similar coma, one that Team Flash can’t cure. Kara and Barry wake up without their powers in an alternate reality where life is like a musical and the only way to escape is by following the script, complete with singing and dancing, to the end. Dermott Downs directed the episode with story by Greg Berlanti & Andrew Kreisberg and teleplay by Aaron Helbing & Todd Helbing (#317). Original airdate 3/21/2017. TUESDAY, MARCH 14 THE FLASH “Into the Speed Force” — (8:00-9:00 p.m. ET) (Content Rating TBD) (HDTV) BARRY TURNS TO THE SPEED FORCE – Desperate to stop Savitar and save his friends, Barry (Grant Gustin) turns to the speed force for answers. H.R. (Tom Cavanagh) gives Jesse (guest star Violett Beane) some advice. Gregory Smith directed the episode written by Brooke Roberts & Judalina Neira (#316). Original airdate 3/14/2017. Tuesday March 7, 2017 8:00pm The Flash The Wrath of Savitar (All New!, HD) SAVITAR VISITS WALLY – While training with Barry (Grant Gustin), Wally (Keiynan Lonsdale) starts to have visions of Savitar, which he hides from the team. A dangerous secret threatens Barry and Iris’ (Candice Patton) happiness. Alexandra La Roche directed the episode written by Andrew Kreisberg & Andrew Wilder (#315). Original airdate 3/7/2017. Tuesday February 28, 2017 8:00pm The Flash Attack on Central City (All New!, HD) THE EPIC CONCLUSION TO THE TWO-PART BATTLE WITH GRODD – When Grodd (voiced by David Sobolov) and his army of gorillas bring the battle to Earth-1, The Flash (Grant Gustin) and team must find a way to stop them before they destroy Central City. Gypsy (guest star Jessica Camacho) returns to join the fight. Meanwhile, Jesse Quick (guest star Violett Beane) decides she wants to stay with Wally (Keiynan Lonsdale) on Earth-1. Dermott Downs directed the episode with story by Todd Helbing and teleplay by Benjamin Raab & Deric A. Hughes (#314). Original airdate 2/28/2017. Tuesday February 21, 2017 8:00pm The Flash Attack on Gorilla City (All New!, HD) BARRY AND TEAM TRAVEL TO GORILLA CITY AND FACE GRODD – When Jesse Quick (guest star Violett Beane) informs the team that her father (Tom Cavanagh) has been abducted, Barry (Grant Gustin), Caitlin (Danielle Panabaker), Cisco (Carlos Valdes) and Julian (Tom Felton) voyage to Earth-2 on a rescue mission to save Harry from Gorilla City. As they trek through the forest, Barry and the team are immediately captured and brought to Grodd (voiced by David Sobolov). Grodd tells them he needs their help to stop Solovar (voiced by Keith David), the leader of Gorilla City, as Solovar wants to invade Earth-1. Meanwhile, back on Earth-1, Jesse and Kid Flash (Keiynan Lonsdale) hit the streets to stop a metahuman that can control gravity, with H.R. and Joe (Jesse L. Martin) guiding them from S.T.A.R. Labs. Dermott Downs directed the episode with story by Andrew Kresiberg and teleplay by Aaron Helbing & David Kob (#313). Original airdate 2/21/2017. BARRY FIGHTS FOR IRIS — Barry (Grant Gustin) is tormented by his vision of the future where Iris (Candice Patton) is murdered by Savitar. When a criminal named Plunder (guest star Stephen Huszar) shows up in Central City, Barry recalls the villain’s presence in his vision of the future and fears that if he catches Plunder, it will cement Iris’ fate. Confused about Barry’s hesitation to stop Plunder, Wally (Keiynan Lonsdale) decides to step in as Kid Flash. Caitlin (Danielle Panabaker) offers Julian (Tom Felton) a job. Millicent Shelton directed the episode written by Grainne Godfree & David Kob (#310). Original airdate 1/24/2017. BARRY SEEKS HELP FROM JAY GARRICK — With Alchemy and Savitar still looming threats, Barry (Grant Gustin) is unable to focus on the Christmas holiday, and especially his relationship with Iris (Candice Patton). Determined to stop Savitar, Barry goes to Earth-3 to get advice from Jay Garrick (guest star John Wesley Shipp). Wally (Keiynan Lonsdale) wants to help Barry fight Savitar and reveals that he’s been training with H.R. (Tom Cavanagh), which doesn’t go over well with Barry. As Cisco (Carlos Valdes) faces his first Christmas without his brother Dante (guest star Nicholas Gonzalez), old wounds are reopened. Rachel Talalay directed the episode with story by Aaron Helbing & Todd Helbing and teleplay by Lauren Certo (#309). Original airdate 12/6/2016. WHAT WOULD YOU SACRIFICE TO HAVE EVERYTHING YOU’VE EVER WANTED? — Barry (Grant Gustin) is living his dream life – his parents are alive, he’s asked Iris West (Candice Patton) on a date and he can finally be a normal guy as Central City has another speedster, Kid Flash (Keiynan Lonsdale), running around saving the city. When Barry starts forgetting parts of his old life, the Reverse Flash (guest star Matt Letscher) taunts his nemesis and tells him that there will be serious repercussions for Barry and the ones he loves if he continues to live in this alternate universe. In addition to losing his memories, his powers will also start to fade. When disaster strikes, Barry must decide if he wants to continue to live in this world as Barry Allen or return to his universe as The Flash. Jesse Warn directed the episode with story by Greg Berlanti & Andrew Kreisberg and teleplay by Brooke Roberts (#301). Original airdate 10/4/2016. CAITLIN CALLS ON HER MOTHER FOR HELP WITH HER GROWING META POWERS — Desperate to understand what is happening to her, Caitlin (Danielle Panabaker) visits her mother, Dr. Tannhauser (guest star Susan Walters), a renowned biomedical researcher, in the hopes that her mother can provide some answers about Caitlin’s growing meta-human powers. However, when Dr. Tannhauser treats her daughter like a test subject, Caitlin grows cold and brings up past wounds causing the two to have a major blowout. Meanwhile, after a mysterious new meta-human attacks Central City, Barry (Grant Gustin) tries to convince Julian (Tom Felton) to let him assist on the case. Kim Miles directed the episode written by Zack Stentz (#305). Original airdate 11/1/2016. The CW's New Season The fun begins this fall on The CW! Time Strikes Back Trailer See what happens when time strikes back. #TheFlash Season 3 premieres Tuesday, October 4 on The CW! THE AFTERMATH — Barry (Grant Gustin) realizes the effects from Flashpoint are much greater than he thought. Meanwhile, Barry meets new co-worker Julian Albert (Tom Felton) and is surprised by Julian’s immediate disdain for Barry. Ralph Hemecker directed the episode written by Aaron Helbing & Todd Helbing (#302). Original airdate 10/11/2016. THE FLASH VS. ZOOM – After Zoom (guest star Teddy Sears) reveals his true plan, Barry (Grant Gustin) vows to do whatever it takes to stop him. Antonio Negret directed the episode written by Aaron Helbing & Todd Helbing (#223). Original airdate 5/24/2016. KATIE CASSIDY GUEST STARS AS BLACK SIREN – After Zoom (guest star Teddy Sears) unleashes an army of Earth-2 meta-humans on Central City, Barry (Grant Gustin) is shaken when he sees their leader is the Black Canary’s Earth-2 doppelganger, the Black Siren (guest star Katie Cassidy). Meanwhile, Wally (Keiynan Lonsdale) takes to the streets to help The Flash stop the meta-humans, which worries Joe (Jesse L. Martin). Iris (Candice Patton) and Henry (guest star John Wesley Shipp) are concerned about Barry taking on Zoom. Jesse Warn directed the episode with story by Greg Berlanti & Andrew Kreisberg and teleplay by Brooke Roberts & David Kob (#222). Original airdate 5/17/2016. KEVIN SMITH DIRECTS – With Barry (Grant Gustin) gone, the team must figure out a way to handle the return of an old enemy – Girder (guest star Greg Finley). Realizing Girder is retracing his steps from his last attack, Iris (Candice Patton) volunteers to act as bait to trap him in S.T.A.R. Labs. Meanwhile, Barry fights to return to his old life. Kevin Smith directed the episode written by Zack Stentz (#221). Original airdate 5/10/2016. DC COMICS’ CHARACTER RUPTURE COMES TO CENTRAL CITY WITH ZOOM – Zoom (guest star Teddy Sears) arrives back on Earth-1 intent on taking over Central City. Barry (Grant Gustin) and Wells (Tom Cavanagh) come up with a plan to stop Zoom once and for all but it’s extremely dangerous. Unsure if he should take the risk, Barry reaches out to both fathers for advice. Henry (guest star John Wesley Shipps) is adamantly opposed to Barry risking his life again but Joe (Jesse L. Martin) thinks he can handle it which puts the two men at odds with each other. Meanwhile, Cisco (Carlos Valdes) is shocked when he vibes the Earth-2 villain Rupture, who happens to be his brother Dante’s (guest star Nicholas Gonzalez) doppelganger. Rupture came to this Earth seeking justice for Reverb’s death. Iris (Candice Patton) decides she’s finally ready to open up to Barry about her feelings for him. Armen V. Kevorkian directed the episode written by Kai Yu Wu & Lauren Certo (#220). Original airdate 5/3/2016. BARRY IS READY TO FACE ZOOM; HUNTER ZOLOMAN’S STORY IS REVEALED – Equipped with the tachyon device, Barry (Grant Gustin) believes he is fast enough to stop Zoom (guest star Teddy Sears) and wants to open the breaches to catch him. Harry (Tom Cavanagh) strongly advises against that plan but after Barry convinces him, Harry reveals that Cisco (Carlos Valdes) has the power to re-open the breach. Meanwhile, Hunter Zoloman’s (Teddy Sears) painful story on Earth-2 is revealed. Stefan Pleszcynski directed the episode written by Joe Peracchio & David Kob (#218). Original airdate 4/19/2016. WELLS IS ATTACKED BY DC COMICS’ CHARACTER GRIFFIN GREY – A meta-human with super strength named Griffin Grey (guest star Haig Sutherland) mistakes Harry (Tom Cavanagh) for Earth-1 Harrison Wells and kidnaps him, demanding that Wells cure him from his current condition. Realizing another brilliant Wells could help track Griffin’s location, Barry asks Jesse (guest star Violett Beane) to help. Meanwhile, Wally (Keiynan Lonsdale) corners Joe (Jesse L. Martin) about The Flash. John Showalter directed the episode written by Brooke Roberts & Katherine Walczak (#219). Original airdate 4/26/2016. A MOMENT IN TIME GETS BARRY ONE STEP CLOSER TO ZOOM; ANDY MIENTUS RETURNS AS HARTLEY RATHAWAY – After the shocking revelation that Zoom is Jay Garrick (Teddy Sears), Barry (Grant Gustin) is more determined than ever to get back to Earth-2 to stop Zoom forever. Desperate to find a way to increase his speed, Barry decides to travel back in time and masquerade as his earlier self in order to get his arch-nemesis, Dr. Harrison Wells/Eobard Thawne (Tom Cavanagh), to teach him how to run faster. However, things don’t go as planned and Barry is stunned to face familiar foe Hartley Rathaway (guest star Andy Mientus), as well as old friend Eddie Thawne (guest star Rick Cosnett). Iris (Candice Patton) makes peace with her past in order to embrace her future. Alice Troughton directed the episode penned by Aaron Helbing and Todd Helbing (#217). Original airdate 3/29/16. JOE AND IRIS GET TO KNOW WALLY — Now that they’ve grown closer, Barry (Grant Gustin) considers telling Patty (guest star Shantel VanSanten) that he is The Flash. Meanwhile, Joe (Jesse L. Martin) and Iris (Candice Patton) try to get to know Wally (Keiynan Lonsdale), and the team hunts down a meta-human who can slow time itself. Rob Hardy directed the episode written by Bryan Q. Miller (#210). Original airdate 1/19/2016. MARK HAMILL, WENTWORTH MILLER AND LIAM MCINTYRE RETURN; KEIYNAN LONSDALE JOINS THE CAST AS WALLY WEST — When Mark Mardon AKA The Weather Wizard (guest star Liam McIntyre) returns to break Leonard Snart AKA Captain Cold (guest star Wentworth Miller) and James Jesse AKA The Trickster (guest star Mark Hamill) out of Iron Heights, Barry (Grant Gustin) must stop these rogues from taking over Central City during Christmas. Meanwhile, Joe (Jesse L. Martin) and Iris (Candice Patton) meet Wally West (Keiynan Lonsdale). Kevin Tancharoen directed the episode written by Andrew Kreisberg (#209). Original airdate 12/8/2015. Tuesday July 19, 2016, 8:00pm The Flash "Legends of Today"
PART ONE OF THE EPIC CROSSOVER WITH “ARROW” — In its second major crossover event with “Arrow,” Vandal Savage (guest star Casper Crump) arrives in Central City and sets his sights on Kendra Saunders (guest star Ciara Renée). After Vandal attacks Kendra and Cisco (Carlos Valdes), they turn to Barry (Grant Gustin) for help. Realizing how dangerous Vandal is, Barry takes Kendra to Star City and asks Oliver and team to hide her until he can figure out how to stop Vandal. However, things quickly go from bad to worse when a man with wings AKA Hawkman (guest star Falk Hentschel) shows up and flies off with Kendra. Meanwhile, Harrison (Tom Cavanagh) develops a serum to make Barry run faster and asks Jay (guest star Teddy Sears) to test it out. Ralph Hemecker directed the episode with story by Greg Berlanti & Andrew Kreisberg and teleplay by Aaron Helbing & Todd Helbing (#208). Original airdate 12/1/2015. BARRY COMES UP WITH A PLAN TO DEFEAT ZOOM — After recent events, Barry (Grant Gustin) decides it’s time to confront Zoom and comes up with a dangerous plan. Caitlin (Danielle Panabaker) sides with Jay (guest star Teddy Sears) and deems it too dangerous for Barry to engage with the speed demon. However, Iris (Candice Patton) shows her support and brings forth a surprising ally. We see what Earth-2 Harrison Wells’ (Tom Cavanagh) life was like before coming through the breech. JJ Makaro directed the episode written by Gabrielle Stanton & Brooke Eikmeier (#206). Original airdate 11/10/2015. DR. LIGHT COMES THROUGH THE BREACH — Barry (Grant Gustin) learns a new breacher, Dr. Light, has come through the portal and sets off to capture her. Jay (guest star Teddy Sears) tells Barry that Dr. Light was not a threat on Earth-2 and that Barry can reason with her. However, during a fight with The Flash, she blinds him and drops some shocking news about Zoom. Meanwhile, Barry and Patty (Shantel VanSanten) go out on a date. Steve Shill directed the episode written by Ben Sokolowski & Grainne Godfree (#205). Original airdate 11/3/2015. INTRODUCING FIRESTORM — Barry (Grant Gustin) and the team look for another Firestorm match for Dr. Stein (Victor Garber). When the team meets Jefferson “Jax” Jackson (guest star Franz Drameh), Caitlin (Danielle Panabaker) has her reservations about whether Jax is the right match for Dr. Stein. Iris (Candice Patton) surprises Joe (Jesse L. Martin) while Barry and Patty (guest star Shantel VanSanten) grow closer. Stefan Pleszczynski directed the episode written by Kai Yu Wu & Joe Peracchio (#204). Original airdate 10/27/2015. MICHAEL IRONSIDE GUEST STARS AS LEWIS SNART — When Barry (Grant Gustin) and the team find out Captain Cold (guest star Wentworth Miller) has been kidnapped, they form an uneasy alliance with his sister, Lisa (guest star Peyton List). However, Barry feels double-crossed when he finds out Snart is working with his father, Lewis Snart (guest star Michael Ironside) on a heist. Meanwhile, Joe (Jesse L. Martin) is faced with a difficult decision. John Showalter directed the episode written by Julian Meiojas & Katherine Walczak (#203). Original airdate 10/20/2015. INTRODUCING JAY GARRICK — Jay Garrick (guest star Teddy Sears), a mysterious man from Earth-2, appears at S.T.A.R. Labs with a dire warning about an evil speedster named Zoom, who is set on destroying The Flash. Barry (Grant Gustin) and the team must decide if they can trust this stranger even as they face yet another powerful meta-human. Meanwhile, Joe (Jesse L. Martin) must deal with a determined officer named Patty Spivot (guest star Shantel VanSanten) who wants to join his meta-human task force. Jesse Warn directed the episode written by Aaron Helbing & Todd Helbing (#202). Original airdate 10/13/2015. BARRY DECIDES HE NEEDS TO PROTECT THE CITY ON HIS OWN — Picking up months after the Singularity attacked Central City, Barry (Grant Gustin) is still struggling to forgive himself for Eddie’s death. Concerned about putting his friends in danger, Barry has pushed everyone away and has chosen to protect the city on his own. When a meta-human named Atom Smasher (guest star Adam Copeland) attacks the city, Iris (Candice Patton) tells Barry that he needs to let his friends help him protect the citizens of Central City. Meanwhile, Cisco (Carlos Valdes) helps Joe (Jesse L. Martin) with his Meta Task Force. Ralph Hemecker directed the episode with story by Greg Berlanti & Andrew Kreisberg and teleplay by Andrew Kreisberg & Gabrielle Stanton (#201). Original airdate 10/6/2015. “ARROW’S” DIGGLE (DAVID RAMSEY) AND LILA (AUDREY MARIE ANDERSON) CROSS OVER TO “THE FLASH” TO TAKE ON KING SHARK – When King Shark escapes from an A.R.G.U.S. holding tank, Lila (guest star Audrey Marie Anderson) and Diggle (David Ramsey) travel to Central City to warn The Flash (Grant Gustin). King Shark shows up at the West house and attacks Joe (Jesse L. Martin), Iris (Candice Patton), Wally (Keiynan Lonsdale) and Barry. Hanelle Culpepper directed the episode written by Benjamin Raab & Deric A. Hughes (#215). Original airdate 2/23/16. THERE IS A NEW SPEEDSTER IN CENTRAL CITY; WILL THE FLASH BE ABLE TO KEEP UP? – Deciding to blow off some steam, Barry (Grant Gustin) and the team head out for a night on the town only to encounter an unexpected speedster who is up to no good. Iris (Candice Patton) is challenged by an assignment from her new boss (guest star Tone Bell), and is surprised when friction turns to flirtation. Glen Winter directed the episode written by Lauren Certo and Lilah Vandenburgh (#216). Original airdate 3/22/16. THE EXCITING CONCLUSION TO THE EARTH-2 JOURNEY – On Earth-2, the team races to find Zoom’s lair and asks for help from the most unexpected source. Meanwhile, back on Earth-1, Caitlin (Danielle Panabaker) rushes to perfect Velocity-9 so that Jay (guest star Teddy Sears) can stop the Geomancer (guest star Adam Stafford). J.J. Makaro directed the episode with story by Todd Helbing & Aaron Helbing and teleplay by David Kob (#214). Original airdate 2/16/16. BARRY VISITS EARTH-2 – Barry (Grant Gustin), Wells (Tom Cavanagh) and Cisco (Carlos Valdes) journey to Earth-2 to rescue Wells’ daughter, Jesse (guest star) from Zoom. Barry is stunned when he runs into Earth-2 Iris (Candice Patton) and Joe (Jesse L. Martin), but nothing prepares him for meeting Killer Frost (Danielle Panabaker) and Deathstorm (guest star Robbie Amell). Meanwhile, back on Earth-1, Jay (guest star Teddy Sears) has to take over the Flash’s responsibilities when a meta-human nicknamed Geomancer (guest star Adam Stafford) attacks Central City. Millicent Shelton directed the episode written by Greg Berlanti & Andrew Kreisberg and Katherine Walczak (#213). Original airdate 2/9/2016. WALLY FLIRTS WITH DANGER — Barry (Grant Gustin) teams up with Wells (Tom Cavanagh) to figure out a way to close the breaches, but they are distracted by a meta-human nicknamed Tar Pit (guest star Marco Grazzini) who can transform into liquid asphalt. Iris (Candice Patton) is concerned for Wally’s (Keiynan Lonsdale) safety after she finds out about his drag racing hobby. When he refuses to stop she makes a bold move that puts her in danger. Rachel Talalay directed the episode with story by Brooke Eikmeier and teleplay by Kai Yu Wu & Joe Peracchio (#212). Original airdate 2/2/2016. HE’S BACK… — When Cisco (Carlos Valdes) gets a vibe of Eobard Thawne (guest star Matthew Letscher), Barry (Grant Gustin) and the team don’t believe it. But, after an attack at Mercury Labs, Christina McGee (guest star Amanda Pays) confirms that the Reverse Flash is back. Meanwhile, Iris (Candice Patton) and Francine (guest star Vanessa A. Williams) share a nice moment that brings Iris closer to her brother, Wally (Keiynan Lonsdale). Michael Allowitz directed the episode written by Aaron Helbing & Todd Helbing (#211). Original airdate 1/26/2016. JOE AND IRIS GET TO KNOW WALLY — Now that they’ve grown closer, Barry (Grant Gustin) considers telling Patty (guest star Shantel VanSanten) that he is The Flash. Meanwhile, Joe (Jesse L. Martin) and Iris (Candice Patton) try to get to know Wally (Keiynan Lonsdale), and the team hunts down a meta-human who can slow time itself. Rob Hardy directed the episode written by Bryan Q. Miller (#210). Original airdate 1/19/2016. Many Video Clips! The CW Tuesday December 1, 2015 8:00pm The Flash "Legends of Today"
GORILLA GRODD RETURNS TO CENTRAL CITY — Grodd returns to Central City and kidnaps Caitlin (Danielle Panabaker). Barry (Grant Gustin) and team race to find her before it’s too late. Meanwhile, Cisco (Carlos Valdes) plans his first date with the new barista at Jitters, Kendra Saunders (guest star Ciara Renée) and Patty (guest star Shantel VanSanten) begins to suspect Barry is hiding something from her. Dermott Downs directed the episode written by Aaron Helbing & Todd Helbing (#207). Original airdate 11/17/2015. BARRY DECIDES HE NEEDS TO PROTECT THE CITY ON HIS OWN — Picking up months after the Singularity attacked Central City, Barry (Grant Gustin) is still struggling to forgive himself for Eddie’s death. Concerned about putting his friends in danger, Barry has pushed everyone away and has chosen to protect the city on his own. When a meta-human named Atom Smasher (guest star Adam Copeland) attacks the city, Iris (Candice Patton) tells Barry that he needs to let his friends help him protect the citizens of Central City. Meanwhile, Cisco (Carlos Valdes) helps Joe (Jesse L. Martin) with his Meta Task Force. Ralph Hemecker directed the episode with story by Greg Berlanti & Andrew Kreisberg and teleplay by Andrew Kreisberg & Gabrielle Stanton (#201). Original airdate 10/6/2015. Many Video Clips on our Forum! EPIC SEASON FINALE; VICTOR GARBER AND ROBBIE AMELL GUEST STAR — Wells (Tom Cavanagh) presents Barry (Grant Gustin) with a life-changing choice. Dr. Martin Stein (guest star Victor Garber) and Ronnie Raymond (guest star Robbie Amell) return to help the S.T.A.R. Labs team with this final fight. Dermott Downs directed the episode with story by Greg Berlanti & Andrew Kreisberg and teleplay by Gabrielle Stanton & Andrew Kreisberg (#123). Original airdate 5/19/2015. Please vote for "The Flash" for Favorite Network Sci-Fi/Fantasy TV Show at http://vote.peopleschoice.com/. Vote for "Flash" to be on Entertainment Weekly's Fall Preview issue cover! Videos: The CW gets even more super when your favorite DC shows return this fall! Check out our great exclusive Photos from 2015 San Diego Comic-Con of Victor Garber, Brandon Routh, Wentworth Miller and Dominic Purcell from their new show "Legends of Tomorrow", an upcoming CW spin-off of characters from "Arrow" and "The Flash!" DVD Review: "The Flash: The Complete First Season"
"The Flash" returns Tuesday, October 6 on The CW at 8:00pm, followed by "iZombie. From tvshowsondvd.com: The Flash - We've Got 'Impossible' News: A Street Date for The Fastest Man Alive! My name is Barry Allen, and I'm the fastest man alive. When I was a child, a saw my mother killed by something impossible. My father went to prison for her murder. Then an accident made me the impossible. To the outside world, I'm just an ordinary forensic scientist, but secretly I use my speed to fight crime and find others like me, and one day I'll find who killed my mother and get justice for my father. I am The Flash. But thanks to an update today from Amazon.com's pre-order listings (thank Grodd! ), on both DVD and high-def Blu-ray Disc formats, we've learned that The Flash - The Complete 1st Season will be available to own starting September 22nd. We don't have finalized package art yet for this freshman season with the Scarlet Speedster (Amazon's only showing some temp art from the show's broadcast promotional campaign). Nor do we have the full details or extras (if any), at least as of this writing. And no, we don't even have word so far about whether or not Warner Home Video is planning to include the various cross-over episodes with Arrow (but we certainly hope that they do!). Stay frosty, friends (and we'll send Captain Cold over to help, if you need), and stay tuned. We'll keep you updated, just as FAST as we can! Flashback Tuesdays Trailer Executive Producers Greg Berlanti and Andrew Kreisberg have a special message about season 2 of The Flash! Writer and executive producer Greg Berlanti already created, writes or produces “Arrow” and “The Mysteries of Laura”, but now he also has a new NBC show “Blindspot” as well as the upcoming CW show "Supergirl." MARK HAMILL (“STAR WARS”) REPRISES HIS ROLE AS THE TRICKSTER — A copycat killer who goes by the name “The Trickster” (guest star Devon Graye) starts setting off bombs in Central City. In order to stop the villain, Barry (Grant Gustin) and Joe (Jesse L. Martin) meet with the original Trickster, a criminal mastermind named James Jesse (guest star Mark Hamill), who has been imprisoned for 20 years. Things quickly go from bad to worse when the Tricksters unite and take Henry (John Wesley Shipp) prisoner. Meanwhile, Iris (Candice Patton) asks Eddie (Rick Cosnett) for help with a case, and flashbacks show how Harrison Wells (Tom Cavanagh) came up with the idea for the particle accelerator. Ralph Hemecker directed the episode written by Andrew Kreisberg (#117). Original airdate 3/31/2015. JOE AND CISCO TRAVEL TO STARLING CITY FOR ANSWERS ABOUT DR. WELLS — Joe (Jesse L. Martin) and Cisco (Carlos Valdes) head to Starling City to continue their investigation of Dr. Wells (Tom Cavanagh). While in town, the duo enlists the help of Captain Lance (guest star Paul Blackthorne), and Cisco meets the Black Canary (guest star Katie Cassidy), who asks him for a favor. Meanwhile, back in Central City, Barry (Grant Gustin) races to catch a meta-human named Hannibal Bates (guest star Martin Novotny) who can transform himself into every person he touches – which includes Eddie (Rick Cosnett), Iris (Candice Patton), Caitlin (Danielle Panabaker) and even The Flash. Wendey Stanzler directed the episode written by Ray Utarnachitt & Cortney Norris (#119). Original airdate 4/21/2015. THE TEAM SETS A TRAP FOR WELLS — Barry (Grant Gustin), Caitlin (Danielle Panabaker), Cisco (Carlos Valdes) and Joe (Jesse L. Martin) set a trap for Wells (Tom Cavanagh). Cisco uses himself as prey which puts him in grave danger. Meanwhile, Eddie (Rick Cosnett) makes a decision regarding Iris (Candice Patton), which leaves Joe a bit unsettled. Steve Shill directed the episode written by Alison Schapker & Brooke Eikmeier (#120). Original airdate 4/28/2015. GRODD RETURNS! — Barry (Grant Gustin) must deal with the Reverse Flash’s (Tom Cavanagh) latest threat to a member of the group. To make matter worse, Dr. Wells unleashes Grodd on the city in order to distract Barry and the team. Joe (Jesse L. Martin), Barry and Cisco (Carlos Valdes) head down into the sewers to catch Grodd but the gorilla quickly gets the upper hand after he kidnaps Joe. Iris (Candice Patton) and Barry have a heart to heart talk. Dermott Downs directed the episode written by Grainne Godfree & Kai Yu Wu (#121). Original airdate 5/5/2015. STEPHEN AMELL, ROBBIE AMELL, WENTWORTH MILLER, LIAM MCINTYRE AND DOUG JONES GUEST STAR — As Wells (Tom Cavanagh) once again gets the upper hand on the S.T.A.R. Labs team, Barry (Grant Gustin) realizes he needs to make a big move and reaches out to an old foe, Captain Cold (guest star Wentworth Miller), for help. Joe (Jesse L. Martin) and Caitlin (Danielle Panabaker) warn Barry that Cold can’t be trusted. True to form, Cold has his own agenda that involves the meta-humans trapped in the containment cells. As things seem to be going from bad to worse, The Flash gets reinforcements – Arrow (guest star Stephen Amell) and Firestorm (guest star Robbie Amell). Doug Aarniokoski directed the episode written by Aaron Helbing & Todd Helbing (#122). Original airdate 5/12/2015. CAPTAIN COLD AND HEAT WAVE RETURN TO CENTRAL CITY; PEYTON LIST GUEST STARS AS LISA SNART — The Flash (Grant Gustin) learns that Captain Cold (guest star Wentworth Miller) and Heat Wave (guest star Dominic Purcell) have returned to Central City. This time Snart has brought along his baby sister Lisa (guest star Peyton List) to help wreak havoc on the city. John Behring directed the episode with story by Grainne Godfree and teleplay by Brooke Eikmeier & Kai Yu Wu (#116). Original airdate 3/24/2015. GENERAL EILING TARGETS FIRESTORM — After the nuclear explosion separates Ronnie (guest star Robbie Amell) and Dr. Stein (guest star Victor Garber), Barry (Grant Gustin) and the team believe both men are safe. Caitlin (Danielle Panabaker) is thrilled to have her fiancé back and prepares to resume their life together while Dr. Stein returns to his wife. However, when General Eiling (guest star Clancy Brown) targets Firestorm, Ronnie and Dr. Stein must decide if they are safer together or apart. Meanwhile, Mason Bridge (guest star Roger Hayworth) tells Iris (Candice Patton) that there is something secretive going on at S.T.A.R. Labs and Dr. Stein gives Barry some important information about time travel. Steve Surjik directed the episode written by Keto Shimizu & Ben Sokolowski (#114). Original airdate 2/17/2015. ROBBIE AMELL AND VICTOR GARBER GUEST STAR AS FIRESTORM — After Ronnie (guest star Robbie Amell) attacks a physicist (guest star Bill Dow), Barry (Grant Gustin) and the team realize they need to go after Caitlin’s (Danielle Panabaker) fiancé who is now a dangerous meta-human. They deduce the best way to track Ronnie is to find Dr. Martin Stein (guest star Victor Garber) who was working on a project called F.I.R.E.S.T.O.R.M. Barry struggles to balance his duties as The Flash and his relationship with Linda Park (guest star Malese Jow), and Joe (Jesse L. Martin) enlists Cisco’s (Carlos Valdes) help to reinvestigate the murder of Nora Allen (guest star Michelle Harrison). General Eiling (Clancy Brown) returns to Central City. Glen Winter directed the episode written by Andrew Kreisberg & Katherine Walczak (#113). Original airdate 2/10/2015. BROADWAY STAR ANDY MIENTUS GUEST STARS AS THE PIED PIPER — Dr. Wells’ (Tom Cavanagh) former protégée, Hartley Rathaway (guest star Andrew Mientus), returns to seek revenge on his mentor after being affected by the particle accelerator explosion. Now able to manipulate sound waves, the brilliant Rathaway is a dangerous threat to both Wells and The Flash (Grant Gustin). Meanwhile, Iris (Candice Patton) is thrilled when she’s hired by the Central City Picture News as their newest cub reporter. Unfortunately, her editor (guest star Tom Butler) pairs her with a veteran reporter, Mason Bridge (guest star Roger Howarth), who wants nothing to do with her. Cisco (Carlos Valdes) recalls his first day on the job at S.T.A.R. Labs when he met Hartley and Caitlin (Danielle Panabaker). Joe (Jesse L. Martin) asks Eddie (Rick Cosnett) for a favor but asks him to keep it a secret from Barry. John Showalter directed the episode written by Alison Schapker & Brooke Eikmier (#111). Original airdate 1/27/2015. BARRY COMES FACE-TO-FACE WITH THE MAN IN THE YELLOW SUIT/AMANDA PAYS RETURNS TO THE FLASH — Barry (Grant Gustin) finds himself face-to-face with his nemesis, the man in the yellow suit, a.k.a. Reverse Flash, who killed his mother. Barry is frustrated when the Reverse Flash escapes, but Dr. Wells (Tom Cavanagh) and Cisco (Carlos Valdes) come up with a plan to trap him. All they need is bait, so they turn to Dr. Tina McGee (guest star Amanda Pays) from Mercury Labs to help. Meanwhile, it’s Christmas at The West household and Iris (Candice Patton) is in full holiday cheer. Eddie (Rick Cosnett) gives her a surprising gift but also leaves her with a question that could change her life. Joe (Jesse L. Martin) joins the search for the man in yellow and ends up in the crossfire. Caitlin (Danielle Panabaker) finds Ronnie (Robbie Amell). Ralph Hemecker directed the episode written by Todd Helbing & Aaron Helbing (#109). Original airdate 12/9/2014. PART ONE OF THE EPIC CROSSOVER EVENT WITH THE FLASH AND ARROW — Barry (Grant Gustin) is thrilled when Oliver (guest star Stephen Amell), Felicity (guest star Emily Bett Rickards) and Diggle (guest star David Ramsey) come to Central City to investigate a case involving a deadly boomerang. Excited about teaming up with his friend, Barry asks Oliver if he’d like to help him stop Ray Bivolo (guest star Paul Anthony), the meta-human Barry is currently tracking. Bivolo causes people to lose control of their emotions and has been using that skill to rob banks. Unfortunately, the superhero partnership doesn’t go as smoothly as Barry expected. When Oliver tells Barry he still has a lot to learn, Barry sets out to prove him wrong by attempting to stop Bivolo alone. However, when Bivolo infects Barry and sets him on a rage rampage, everyone is in danger, and the only one who can stop him is the Arrow. Meanwhile, Iris (Candice Patton) is furious when Eddie (Rick Cosnett) tries to get a task force to stop The Flash, Joe and Dr. Wells (Tom Cavanagh) agree the Arrow is a bad influence on Barry, and Caitlin and Cisco deal with a new team in S.T.A.R. Labs. Glen Winter directed the episode with story by Greg Berlanti & Andrew Kreisberg and teleplay by Ben Sokolowski & Brooke Eikmeier (#108). Original airdate 12/2/2014. THE FLASH GETS A VISIT FROM DC CHARACTERS FAROOQ AND THE CLOCK KING — The Flash (Barry Allen) goes up against Farooq aka Blackout (guest star Michael Reventar), a metahuman who can harness electricity. During their battle, Farooq zaps The Flash and siphons all his electricity, leaving The Flash without his speed. Dr. Wells (Tom Cavanagh), Caitlin (Danielle Panabaker) and Cisco (Carlos Valdes) work to reverse the effects on Barry, but their efforts are disrupted when Farooq comes banging on S.T.A.R. Labs doors in search of Wells, who he blames for his accident. Without Barry’s powers to protect them, the group must figure out a way to save themselves from the metahuman. Meanwhile, Tockman (guest star Robert Knepper) manages a coup inside the Central City police department and takes several people hostage, including Joe (Jesse L. Martin) and Iris (Candice Patton). While Iris is sure The Flash will save them, Eddie (Rick Cosnett) has a trick up his sleeve. Larry Shaw directed the episode written by Alison Schapker & Grainne Godfree (#107). Original airdate 11/25/2014. KELLY FRYE GUEST STARS AS DC COMICS’ PLASTIQUE AND CLANCY BROWN GUEST STARS AS GENERAL EILING — After a bomb goes off downtown, the army, led by General Eiling (guest star Clancy Brown, “Sleepy Hollow” and “The Shawshank Redemption”), rolls in and takes over the case, much to Joe’s (Jesse Martin) surprise. Suspicious, Joe tells Barry (Grant Gustin) that he and his friends at S.T.A.R. Labs should look into the army’s involvement. Wells (Tom Cavanagh) informs the team that Eiling was experimenting on his men to turn them into super soldiers. Cisco (Carlos Valdes) confirms one of Eiling’s soldiers, Bette Sans Souci (guest star Kelly Frye, “Boardwalk Empire” and “Brave”), was at the bomb site. The Flash tracks her down and realizes that she’s not setting off the bombs, she is a meta-human who can blow things up just by touching them. Meanwhile, when Joe learns Iris is writing about “the streak,” he tells Barry to make her stop. Barry realizes Iris won’t listen to him so he decides to have The Flash pay her a visit. Dermott Downs directed the episode written by Aaron Helbing & Todd Helbing & Brooke Eikmeier (#105). Original airdate 11/11/2014. BARRY HAS FUN WITH HIS NEW POWERS BUT A SETBACK MAKES HIM QUESTION HIS ABILITY TO BE A HERO — Barry (Grant Gustin) escorts Iris (Candice Patton) to a university gathering honoring scientist Simon Stagg (guest star William Sadler). When six gunmen storm the event, Barry changes into The Flash and tries to stop them. While he does save a man’s life, he passes out before he can capture the robbers, which frustrates him. As Dr. Wells (Tom Cavanagh), Caitlin (Danielle Panabaker) and Cisco (Carlos Valdes) scramble to find out what’s wrong with Barry, Joe (Jesse Martin) comes down hard on Barry for taking the law into his own hands and risking his life. Barry realizes that it wasn’t six gunmen but a metahuman named Danton Black (guest star Michael Christopher Smith), who can make multiples of himself. Meanwhile, Iris becomes even more intrigued by the “red streak.” David Nutter directed the episode with story by Greg Berlanti & Andrew Kreisberg and teleplay by Andrew Kreisberg & Geoff Johns (101). (Original airdate 10/14/2014). THE FASTEST MAN ALIVE IS BORN — Barry Allen (Grant Gustin) was just 11 years old when his mother was killed in a bizarre and terrifying incident and his father (John Wesley Shipp) was falsely convicted of the murder. With his life changed forever by the tragedy, Barry was taken in and raised by Detective Joe West (Jesse L. Martin), the father of Barry’s best friend, Iris (Candice Patton). Now, Barry has become a brilliant, driven and endearingly geeky CSI investigator, whose determination to uncover the truth about his mother’s strange death leads him to follow up on every unexplained urban legend and scientific advancement that comes along. Barry’s latest obsession is a cutting edge particle accelerator, created by visionary physicist Harrison Wells (Tom Cavanagh) and his S.T.A.R. Labs team members, Caitlin Snow (Danielle Panabaker) and Cisco Ramon (Carlos Valdes), who claim that this invention will bring about unimaginable advancements in power and medicine. However, something goes horribly wrong during the public unveiling, and when the devastating explosion causes a freak storm, many lives are lost and Barry is struck by lightning. After nine months in a coma, Barry awakens to find his life has changed once again – the accident has given him the power of super speed. Thrilled with his new powers, Barry learns how to control them with the help of Dr. Wells and his team. However, keeping his secret from his best friend Iris (Candice Patton) is proving to be harder than he thought, especially when Joe’s new partner, Eddie Thawne (Rick Cosnett), catches her eye. When another meta-human attacks the city, it’s time to put Barry’s new powers, and himself, to the test. David Nutter directed the episode with story by Greg Berlanti & Andrew Kreisberg and teleplay by Andrew Kreisberg & Geoff Johns (#101). Original airdate 10/7/2014. Flashback Tuesdays Trailer Executive Producers Greg Berlanti and Andrew Kreisberg have a special message about season 2 of The Flash! EPIC SEASON FINALE; VICTOR GARBER AND ROBBIE AMELL GUEST STAR - Wells (Tom Cavanagh) presents Barry (Grant Gustin) with a life-changing choice. Dr. Martin Stein (guest star Victor Garber) and Ronnie Raymond (guest star Robbie Amell) return to help the S.T.A.R. Labs team with this final fight. Dermott Downs directed the episode with story by Greg Berlanti & Andrew Kreisberg and teleplay by Gabrielle Stanton & Andrew Kreisberg (#123). Original airdate 5/19/2015. Extended Trailer Everything happens for a reason. Season 1 Sizzle Speed through The Flash season with this sizzle from The CW Upfronts! The CW: Defy your world and dare to live in ours. STEPHEN AMELL, ROBBIE AMELL, WENTWORTH MILLER, LIAM MCINTYRE AND DOUG JONES GUEST STAR - As Wells (Tom Cavanagh) once again gets the upper hand on the S.T.A.R. Labs team, Barry (Grant Gustin) realizes he needs to make a big move and reaches out to an old foe, Captain Cold (guest star Wentworth Miller), for help. Joe (Jesse L. Martin) and Caitlin (Danielle Panabaker) warn Barry that Cold can't be trusted. True to form, Cold has his own agenda that involves the meta-humans trapped in the containment cells. As things seem to be going from bad to worse, The Flash gets reinforcements - Arrow (guest star Stephen Amell) and Firestorm (guest star Robbie Amell). Doug Aarniokoski directed the episode written by Aaron Helbing & Todd Helbing (#122). Original airdate 5/12/2015. Trailer Is Team Flash ready to face Eobard Thawne? Clip Catching Grodd is anything but easy. ]ARROW’S FELICITY SMOAK (EMILY BETT RICKARDS) AND RAY PALMER (BRANDON ROUTH) ARRIVE IN CENTRAL CITY; EMILY KINNEY (“The Walking Dead”) GUETS STARS AS BRIE LARVIN — Barry (Grant Gustin) is surprised when Felicity Smoak (guest star Emily Bett Rickards) arrives from Starling City along with her boyfriend, Ray Palmer (guest star Brandon Routh), who flies in as the Atom. They’ve come to visit S.T.A.R. Labs as Ray needs help with his suit. Their timing turns out to be fortuitous because it’s all hands on deck after a meta human named Brie Larvin (guest star Emily Kinney) unleashes hundreds of robotic bees to attack and kill her former co-workers, including Dr. Tina McGee (guest star Amanda Pays). A group dinner with Barry, Felicity, Ray, Iris (Candice Patton) and Eddie (Rick Cosnett) turns into a disaster. Kevin Tancharoen directed the episode written by Grainne Godfree & Kai Yu Wu (#118). Original airdate 4/14/2015. LIAM MCINTYRE GUEST STARS AS THE WEATHER WIZARD; CISCO REALIZES DR. WELLS IS HIDING SOMETHING — Mark Mardon aka The Weather Wizard (guest star Liam McIntyre) appears in Central City intent on avenging his brother Clyde’s death, and sets his sights on Joe (Jesse L. Martin), who shot Clyde. When Mardon attacks Joe and Barry (Grant Gustin), Barry is able to super-speed them to safety but Mardon gets away. Barry warns Joe not to go after a meta-human alone but Joe doesn’t listen and ends up in grave danger. Meanwhile, Cisco (Carlos Valdes) looks into the night the team captured the Reverse Flash and realizes something doesn’t add up and begins to wonder whether Joe was right about Dr. Wells (Tom Cavanagh). Barry and Linda (guest star Malese Jow) end up on an awkward double date with Eddie (Rick Cosnett) and Iris (Candice Patton). Thor Freudenthal directed the episode written by Todd Helbing & Aaron Helbing (#115). Original airdate 3/17/2015. Trailer Meet the villain who's all tricks and no joke. The Flash is all new Tuesday at 8/7c, followed by iZombie! LOVE IS IN THE AIR — Caitlin (Danielle Panabaker) decides that she and Barry (Grant Gustin) need to move on from Ronnie (guest star Robbie Amell) and Iris (Candice Patton) and find new loves so she takes him for a night out at the local karaoke bar. Caitlin doesn’t have any luck making a love connection but Barry meets Linda Park (guest star Malese Jow), a sports reporter for the Central City Picture News, and asks her out on a date. When Barry tells Iris he has a date, Iris is surprised by her reaction. Meanwhile, Cisco (Carlos Ramon) considers Hartley’s (guest star Andy Mientus) dangerous offer and the team searches for Shawna (guest star Britne Oldford), a meta-human with teleportation powers, who just busted her boyfriend Clay (guest star Micah Parker) out of Iron Heights. When Henry (guest star John Wesley Shipps) snoops around in an attempt to help Joe (Jesse L. Martin) and Barry solve the crime, he ends up in the infirmary after getting roughed up by inmates. Rob Hardy directed the episode written by Aaron Helbing & Todd Helbing (#112). Original airdate 2/3/2015. WENTWORTH MILLER AND DOMINIC PURCELL (“PRISON BREAK”) TEAM UP AGAIN AS CAPTAIN COLD AND HEAT WAVE CHALLENGE THE FLASH TO AN EPIC BATTLE — Leonard Snart AKA Captain Cold (guest star Wentworth Miller) returns to Central City with a new hotheaded partner in tow – Mick Rory AKA Heat Wave (guest star Dominic Purcell). The duo plan to steal a multi-million dollar painting, but Cold has another agenda while in town – to set a trap for The Flash. Snart and Mick kidnap someone close to The Flash and threaten to kill them unless The Flash shows up for a battle of fire and ice. Barry tells Joe (Jesse L. Martin) he isn’t sure he should take on Snart again after the casualties that happened the last time they fought. Meanwhile, Barry asks Dr. Wells (Tom Cavanagh), Caitlin (Danielle Panabaker) and Cisco (Carlos Valdes) to help him double his training efforts so he’s ready for the Reverse Flash when he returns to Central City. Iris (Candice Patton) deals with the aftermath of Barry’s confession, and Cisco makes the CCPD a new shield. Nick Copus directed the episode written by Geoff Johns & Kai Yu Wu (#110). Original airdate 1/20/2015. PART ONE OF THE EPIC CROSSOVER EVENT WITH THE FLASH AND ARROW — Barry (Grant Gustin) is thrilled when Oliver (guest star Stephen Amell), Felicity (guest star Emily Bett Rickards) and Diggle (guest star David Ramsey) come to Central City to investigate a case involving a deadly boomerang. Excited about teaming up with his friend, Barry asks Oliver if he’d like to help him stop Roy Bivolo (guest star Paul Anthony), the meta-human Barry is currently tracking. Bivolo causes people to lose control of their emotions and has been using that skill to rob banks. Unfortunately, the superhero partnership doesn’t go as smoothly as Barry expected. When Oliver tells Barry he still has a lot to learn, Barry sets out to prove him wrong by attempting to stop Bivolo alone. However, when Bivolo infects Barry and sets him on a rage rampage, everyone is in danger, and the only one who can stop him is the Arrow. Meanwhile, Iris (Candice Patton) is furious when Eddie (Rick Cosnett) tries to get a task force to stop The Flash, Joe and Dr. Wells (Tom Cavanagh) agree the Arrow is a bad influence on Barry, and Caitlin and Cisco deal with a new team in S.T.A.R. Labs. Glen Winter directed the episode with story by Greg Berlanti & Andrew Kreisberg and teleplay by Ben Sokolowski & Brooke Eikmeier (#108). Original airdate 12/2/2014. GREG FINLEY GUEST STARS AS DC COMICS’ VILLAIN GIRDER — The Flash (Grant Gustin) faces a new meta-human named Tony (guest star Greg Finley, “Star-Crossed,” “Secret Life of the American Teenager”), who can turn himself into girded steel at will. While Dr. Wells (Tom Cavanagh) and Caitlin (Danielle Panabaker) are concerned about Barry’s safety, Cisco (Carlos Valdes) comes up with a plan to take Tony down. Meanwhile, Iris’s (Candice Patton) blog on The Flash gets her into trouble, and Eddie (Rick Cosnett) witnesses Tony’s abilities firsthand and begins to ask questions that Joe (Jesse L. Martin) doesn’t want answered. Joe asks Dr. Wells to help him solve Nora Allen’s murder. Millicent Shelton directed the episode written by Jaime Paglia & Chris Rafferty (#106). Original airdate 11/18/2014. WENTWORTH MILLER GUEST STARS AS DC COMICS’ VILLAIN CAPTAIN COLD; FELICITY FROM “ARROW” CROSSES OVER INTO CENTRAL CITY — The Flash (Grant Gustin) stops a robbery but the culprits get away after shooting a guard, and The Flash chooses to save the man instead of following the criminals. Joe (Jesse L. Martin) shows Barry a book of suspects and Barry identifies Leonard Snart (guest star Wentworth Miller, “Prison Break”) as the leader of the group. While investigating the case, Barry gets a surprise visit from an old friend – Felicity Smoak (Emily Bett Rickards, “Arrow”), who heard about his new abilities and came to check them out for herself. She joins him at S.T.A.R. Labs to help stop Snart after it’s revealed that Snart his gotten his hands on a stolen “cold gun,” which could kill The Flash. Dr. Wells (Tom Cavanagh) is furious when he finds out that Cisco (Carlos Valdes) built the cold gun without telling anyone and now it’s missing. Meanwhile, Iris (Candice Patton) is getting the silent treatment from Joe because of her relationship with Eddie (Rick Cosnett). Finally, The Flash and Captain Cold have an epic confrontation. Glen Winter directed the episode written by Geoff Johns & Kai Yu Wu (#104). Original airdate 10/28/2014. PART ONE OF THE EPIC CROSSOVER EVENT WITH THE FLASH AND ARROW — PART ONE OF THE EPIC CROSSOVER EVENT WITH THE FLASH AND ARROW — Barry (Grant Gustin) is thrilled when Oliver (guest star Stephen Amell), Felicity (guest star Emily Bett Rickards) and Diggle (guest star David Ramsey) come to Central City to investigate a case involving a deadly boomerang. Excited about teaming up with his friend, Barry asks Oliver if he’d like to help him stop Ray Bivolo (guest star Paul Anthony), the meta-human Barry is currently tracking. Bivolo causes people to lose control of their emotions and has been using that skill to rob banks. Unfortunately, the superhero partnership doesn’t go as smoothly as Barry expected. When Oliver tells Barry he still has a lot to learn, Barry sets out to prove him wrong by attempting to stop Bivolo alone. However, when Bivolo infects Barry and sets him on a rage rampage, everyone is in danger, and the only one who can stop him is the Arrow. Meanwhile, Iris (Candice Patton) is furious when Eddie (Rick Cosnett) tries to get a task force to stop The Flash, Joe and Dr. Wells (Tom Cavanagh) agree the Arrow is a bad influence on Barry, and Caitlin and Cisco deal with a new team in S.T.A.R. Labs. Glen Winter directed the episode with story by Greg Berlanti & Andrew Kreisberg and teleplay by Ben Sokolowski & Brooke Eikmeier (#108). Original airdate 12/2/2014. KELLY FRYE GUEST STARS AS DC COMICS’ PLASTIQUE AND CLANCY BROWN GUEST STARS AS GENERAL EILING — After a bomb goes off downtown, the army, led by General Eiling (guest star Clancy Brown), rolls in and takes over the case, much to Joe’s (Jesse Martin) surprise. Suspicious, Joe tells Barry (Grant Gustin) that he and his friends at S.T.A.R. Labs should look into the army’s involvement. Wells (Tom Cavanagh) informs the team that Eiling was experimenting on his men to turn them into super soldiers. Cisco (Carlos Valdes) confirms one of Eiling’s soldiers, Bette Sans Souci (guest star Kelly Frye), was at the bomb site. The Flash tracks her down and realizes that she’s not setting off the bombs, she is a meta-human who can blow things up just by touching them. Meanwhile, when Joe learns Iris is writing about “the streak,” he tells Barry to make her stop. Barry realizes Iris won’t listen to him so he decides to have The Flash pay her a visit. Dermott Downs directed the episode written by Aaron Helbing & Todd Helbing & Brooke Eikmeier (#105). Original airdate 11/11/2014. WENTWORTH MILLER GUEST STARS AS DC COMICS’ VILLAIN CAPTAIN COLD — The Flash (Grant Gustin) stops a robbery but the culprits get away after shooting a guard, and The Flash chooses to save the man instead of following the criminals. Joe (Jesse L. Martin) shows Barry a book of suspects and Barry identifies Leonard Snart (guest star Wentworth Miller, “Prison Break”) as the leader of the group. Snart revises his plan to steal the Kahndaq Dynasty Diamond and gets a boost when he gets his hands on a stolen “cold gun,” which could kill The Flash. Dr. Wells (Tom Cavanagh) is furious when he finds out that Cisco (Carlos Valdes) built the cold gun without telling anyone and now it’s missing. Meanwhile, Iris (Candice Patton) is getting the silent treatment from Joe because of her relationship with Eddie (Rick Cosnett). Finally, The Flash and Captain Cold have an epic confrontation. Glen Winter directed the episode written by Goff Johns & Kai Yu Wu (#104). Original airdate 10/28/2014. BARRY HAS FUN WITH HIS NEW POWERS BUT A SETBACK MAKES HIM QUESTION HIS ABILITY TO BE A HERO — Barry (Grant Gustin) escorts Iris (Candice Patton) to a university gathering honoring scientist Simon Stagg (guest star William Sadler). When six gunmen storm the event, Barry changes into The Flash and tries to stop them. While he does save a man’s life, he passes out before he can capture the robbers, which frustrates him. As Dr. Wells (Tom Cavanagh), Caitlin (Danielle Panabaker) and Cisco (Carlos Valdes) scramble to find out what’s wrong with Barry, Joe (Jesse Martin) comes down hard on Barry for taking the law into his own hands and risking his life. Barry realizes that it wasn’t six gunmen but a metahuman named Danton Black (guest star Michael Christopher Smith), who can make multiples of himself. Meanwhile, Iris becomes even more intrigued by the “red streak.” David Nutter directed the episode with story by Greg Berlanti & Andrew Kreisberg and teleplay by Andrew Kreisberg & Geoff Johns (101). Original airdate 10/14/2014. Airs again on Wednesday. THE FASTEST MAN ALIVE IS BORN — Barry Allen (Grant Gustin) was just 11 years old when his mother was killed in a bizarre and terrifying incident and his father (John Wesley Shipp) was falsely convicted of the murder. With his life changed forever by the tragedy, Barry was taken in and raised by Detective Joe West (Jesse L. Martin), the father of Barry’s best friend, Iris (Candice Patton). Now, Barry has become a brilliant, driven and endearingly geeky CSI investigator, whose determination to uncover the truth about his mother’s strange death leads him to follow up on every unexplained urban legend and scientific advancement that comes along. Barry’s latest obsession is a cutting edge particle accelerator, created by visionary physicist Harrison Wells (Tom Cavanagh) and his S.T.A.R. Labs team members, Caitlin Snow (Danielle Panabaker) and Cisco Ramon (Carlos Valdes), who claim that this invention will bring about unimaginable advancements in power and medicine. However, something goes horribly wrong during the public unveiling, and when the devastating explosion causes a freak storm, many lives are lost and Barry is struck by lightning. After nine months in a coma, Barry awakens to find his life has changed once again – the accident has given him the power of super speed. Thrilled with his new powers, Barry learns how to control them with the help of Dr. Wells and his team. However, keeping his secret from his best friend Iris (Candice Patton) is proving to be harder than he thought, especially when Joe’s new partner, Eddie Thawne (Rick Cosnett), catches her eye. When another meta-human attacks the city, it’s time to put Barry’s new powers, and himself, to the test. David Nutter directed the episode with story by Greg Berlanti, Andrew Kresiberg and Geoff Johns and teleplay by Andrew Kreisberg and Geoff Johns (#101). Original airdate 10/7/2014. DC fans, get ready for Super Hero Saturday Night! Warner Bros. Television and DC Entertainment welcome fans into the world of some of DC Comics' greatest characters during a three-hour experience in Hall H. The exclusive evening will feature a Q&A with stars and producers, plus individual special video presentations and Q&A's with stars and producers from Arrow, The Flash, and Gotham. Also, don't miss a special Q&A with cast and producers of DC's Legends of Tomorrow and a peek at the new digital series Vixen. The Flash - The cast and creative team behind The CW's highest-rated show of all time, The Flash, speed back to San Diego for their second Comic-Con appearance, bringing with them answers to many of the questions left unanswered in the jaw-dropping Season 1 finale. Following the defeat of Barry Allen's arch-nemesis Eobard Thawne (aka Reverse Flash), Team Flash quickly turned their attention to the singularity swirling high above Central City, which fans last saw consuming everything in its path. Armed with the heart of a hero and the ability to move at super speeds, Barry charged into the eye of the singularity, but will he actually be able to save his city from impending doom? From Bonanza Productions Inc. in association with Berlanti Productions and Warner Bros. Television, The Flash airs Tuesdays at 8/7c on The CW, and The Flash: The Complete First Season will be released on Blu-ray combo pack, DVD, and Digital HD on September 22. DC's Legends of Tomorrow- When heroes alone are not enough, the world needs legends. In DC's Legends of Tomorrow, having seen the future, one he will desperately try to prevent from happening, time-traveling rogue Rip Hunter is tasked with assembling a disparate group of both heroes and villains to confront an unstoppable threat-one in which not only is the planet at stake, but all of time itself. From the creators of The Flash and Arrow comes this superhero team-up unlike anything that's ever been seen on television before. Combining characters from both shows, in addition to new heroes from the DC Comics pantheon, this epic story lives in an interconnected universe and presents a high-stakes feature film experience with edge-of-your-seat action, time travel, seamless visual effects and an infectiously fun character dynamic that's like a Flash/Arrow crossover times one hundred! From Berlanti Productions in association with Warner Bros. Television, DC's Legends of Tomorrow premieres Midseason on The CW. Vixen - Originally from Africa, Mari McCabe's parents were killed by local greed, corruption, and wanton violence. But the orphaned Mari refuses to succumb to the terrors surrounding her. Inheriting her family's Tantu Totem, Mari can access the powers of animals-anything from the super-strength of a gorilla to the speed of a cheetah. As Vixen, she fights valiantly to protect the world from threats like those that claimed her family. This six-episode series debuting on CW Seed this fall, featuring the voices of Stephen Amell (Arrow), Grant Gustin (The Flash), Emily Bett Rickards (Arrow), and Carlos Valdes (The Flash). It follows Mari's path as she first learns to embrace her incredible abilities and discovers the source of the mysterious Tantu Totem's power. Hall H at the San Diego Comic-Con in the San Diego Convention Center. The Flash won The People's Choice Award for "Favorite New TV Drama." The Flash truly becomes The Flash, unless The CW is a house of lies! THE CW ANNOUNCES FULL SEASON ORDERS FOR "THE FLASH" AND "JANE THE VIRGIN"
October 27, 2014 (Burbank, CA) — The series premiere of THE FLASH rises to 6.8 million total viewers, becoming The CW's most watched telecast of any series in the history of the network, in final Live + 7 Day Nielsen ratings data. THE FLASH premiere is also the highest-rated telecast among Men 18-49 (3.2) ever on the network. THE FLASH is The CW’s highest-rated series debut ever in Men 18-34 (2.5), and the second highest-rated series premiere in Adults 18-49 (2.6). THE FLASH premiere has been seen more than 13 million times across all platforms, including initiated streams on digital platforms and total unduplicated viewers on-air over two airings the week of Oct. 7. Tom Cavanagh appears on "Live with Kelly & Michael" Tuesday 10/21. October 15, 2014 (Burbank, CA) – The second episode of THE FLASH kept going at full speed last night, ranking #1 in the hour among men 18-34 (1.5/6), #2 in the hour in adults 18-34 (1.3/5), and #3 in the hour in both adults 18-49 (1.6/5) and in total viewers (4.12 million), according to preliminary Live Plus Same Day Nielsen ratings for Tuesday, October 14, 2014. With increased competition, including an original episode of "The Voice" on NBC and the American League Championship Series on TBS, THE FLASH retained better than 80% of its record-setting Live + Same Day premiere ratings, holding 86% in total viewers, 81% in adults 18-34, and 84% of its adults 18-49 rating. Behind only last week's series premiere, THE FLASH was The CW's second most-watched show in its time period (Tuesday 8-9pm) in six years (9/2/08), and the network's second highest-rated show in the time period in adults 18-49 in six years (10/28/08), and posted the second best performance among adults 18-34 in more than three and a half years (2/1/11). Versus this same week last year, THE FLASH improved its time period performance by +86% in total viewers, +18% in adults 18-34, +150% in men 18-34, and +45% in adults 18-49. THE FLASH also grew at the half hour mark across all key breaks: +5% in total viewers, +8% in adults 18-34, and +6% in adults 18-49. SUPERNATURAL also held up well versus last week's 10th season premiere, holding steady in adults 18-49 (1.0/3), and growing +11% in women 18-34 (1.0/3) and +10% in women 18-49 (1.1/3). For the night, The CW finished #3, ahead of ABC and Fox, in adults 18-34 (1.1/4), and in adults 18-49 (1.3/4), and beat Fox for the night in total viewers (3.16 million). Versus this same week last year, The CW's Tuesday night saw gains of +39% in total viewers, +10% in adults 18-34, and +18% in adults 18-49. With Live + 3 Day viewing counted, last week's series premiere of THE FLASH scored 6.42 million viewers and was The CW's most-watched premiere ever, jumping +33% over its Live + Same Day viewership total. 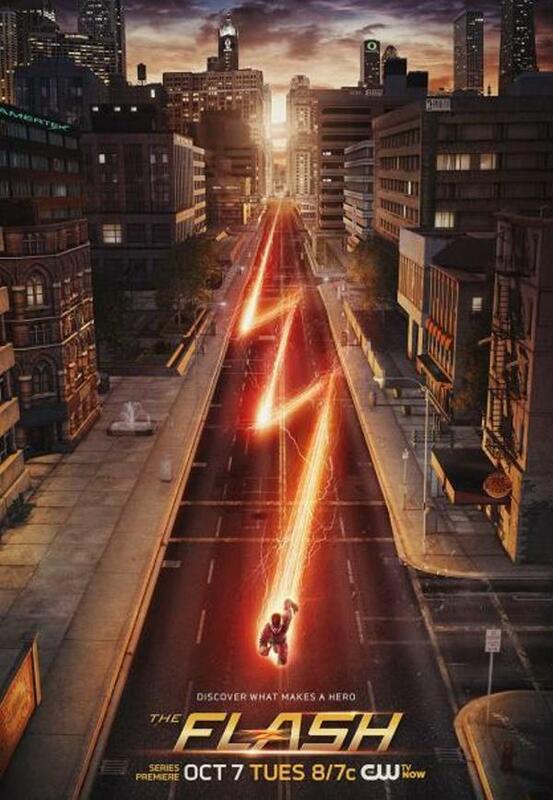 October 8, 2014 (Burbank, CA) – The CW’s highly anticipated new series THE FLASH zoomed out of the gates last night. Tuesday’s series debut of THE FLASH (8:00-9:00 pm) marked The CW’s most watched (4.54 million) and highest-rated series premiere in adults 18-49 (1.8/6) in more than five years, since THE VAMPIRE DIARIES bowed in 2009, according to preliminary Live Plus Same Day Nielsen ratings for Tuesday, October 7, 2014. THE FLASH is The CW’s third most watched and third highest-rated series premiere ever in adults 18-49, behind only THE VAMPIRE DIARIES and 90210. The latest episode of DC's web series "DC All Access" is now available, full of fan-favorite news and interviews from the world of DC Entertainment, and I wanted to send it along in case you'd like to share with your readers! August 26, 2014 (Burbank, CA) - The CW Network has unveiled the key art designs for its highly anticipated new Fall 2014 series, JANE THE VIRGIN and THE FLASH. The CW’s Creative Director is Rick Frey. Photography credit for JANE THE VIRGIN is Frank Ockenfels. Check out our review of the pilot episode! Visit our Primetime Forum for lots more Flash News!